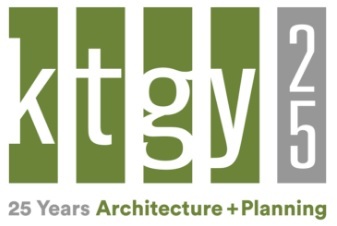 Founded in 1991, KTGY Architecture + Planning is an international award-winning full-service architecture and planning firm delivering innovation, artistry and attention to detail across multiple offices and studios, ensuring that clients and communities get the best the firm has to offer no matter the building type or location. KTGY’s architects and planners combine big picture opportunities, leading-edge sustainable practices and impeccable design standards to help create developments of enduring value. KTGY serves clients worldwide from offices located in Chicago, Denver, Irvine, Los Angeles, Oakland, Pune and Tysons. On Thursday, September 8, 2016, the City of San Luis Obispo celebrated the grand opening of South Hills Crossing, a new affordable apartment community by ROEM Corporation in partnership with the Housing Authority of the San Luis Obispo (HASLO). The grand opening celebration was held at 1:00 p.m. at 309 South Street, San Luis Obispo, CA 93401.
International award-winning KTGY Architecture + Planning announced today that it has been selected by Orange County-based Civic Partners as the designer of Artisan Alley at The Diamond, a unique retail development located in western Riverside County in the City of Lake Elsinore, Calif. Conveniently located across the street from the Lake Elsinore Diamond Stadium, the proposed retail development will bring a creative, commercial destination, which is sure to energize the neighboring area. International award-winning firm KTGY Architecture + Planning is pleased to announce that the Granada Hotel, a new four-story, contemporary-style boutique hotel with 60 guest rooms situated in the heart of downtown Morgan Hill, Calif., was unanimously approved by the city’s planning commission on Tuesday, April 26, 2016. The project now moves on to the city council for final approval. International award-winning firm KTGY Architecture + Planning is pleased to announce that Chapman University’s Marybelle and Sebastian P. Musco Center for the Arts recently celebrated its grand opening. Planet Home Living meets the demand of distinguished home-buyers looking for what is often impossible to find: a sleek, modern new home in an established, amenity-rich area. Designed by national award-winning firm KTGY Architecture + Planning, PRISM will offer fifteen single-family detached, new homes in Eagle Rock, just north of downtown Los Angeles. St. Anton Communities announces the beginning of construction activity on a major Downtown Campbell housing community, an $88 million project involving 14 separate parcels of land assembled through a multi-year effort. IRVINE, CA - November 26, 2013 - (RealEstateRama) -- Award-winning national firm KTGY Group, Inc., Architecture + Planning, is pleased to announce that the 55+ Housing Council, a special interest council of the Building Industry Association (BIA) of Southern California, has recently honored KTGY Director Gina Nixon with the SAGE Award for Volunteer of the Year and Perris Station Senior Apartment Homes with the SAGE Award for "On the Boards" Project of the Year in the Redevelopment category. IRVINE, CA - September 16, 2013 - (RealEstateRama) -- Award-winning national firm KTGY Group, Inc., Architecture + Planning, announced today that the firm's entry "Wishing Away Hunger" in Orange County’s 6th Annual CANstruction design/build competition at the South Coast Plaza in Costa Mesa, Calif., won an Honorable Mention for its popular Genie from Disney's Aladdin, made of 3,000 canned food items. KTGY’s innovative design and planning capabilities, normally reserved for real estate builders, owners, investors and developers of all property types, were used to design this very colorful, 10-foot tall Genie. IRVINE, CA - June 24, 2013 - (RealEstateRama) -- Award-winning national firm KTGY Group, Inc., Architecture + Planning, is pleased to announce that its innovative ABC Green Home has won the prestigious 2013 PCBC Gold Nugget Grand Award for the "Best Zero Net Energy Home Design." Designed as an Affordable, Buildable and Certifiable (ABC) Green Home, this very appealing Craftsman-style, 1,695-square-foot, 3-bedroom, 3-bath home is a net zero energy-consumption model home, which provides a blueprint for builders on how to mass produce environmentally-friendly houses that generate as much energy as they consume. IRVINE, CA - June 10, 2013 - (RealEstateRama) -- Award-winning national firm KTGY Group, Inc., Architecture + Planning, is pleased to announce that Hutton Companies, one of Southern California’s foremost developers, is nearing completion on The Paseos at Magnolia Luxury Apartment Community in Riverside, Calif., a $30 million, 168-unit, 3-story, garden-style, walk-up apartment community located close to regional shopping, transportation, jobs, and restaurants. Residents will be moving in as buildings are completed with the first group of residents moving in next month, July 2013. Completion of The Paseos at Magnolia Luxury Apartment Community is expected in autumn 2013. IRVINE, CA - June 3, 2013 - (RealEstateRama) -- Award-winning KTGY Group, Inc., Architecture + Planning, is pleased to announce that KTGY Principal Manny Gonzalez, AIA, NCARB, LEED AP has been invited to be a speaker at the PCBC 2013 show, Homebuilding’s Premier Tradeshow and Conference, held June 5-6, 2013, at the San Diego Convention Center in San Diego, Calif. Gonzalez is a frequent guest speaker and panelist at various industry events and webinars and currently serves as PCBC's Co-Chair of the Multifamily Trends Forum. IRVINE, CA - May 20, 2013 - (RealEstateRama) -- Award-winning national firm KTGY Group, Inc., Architecture + Planning, is pleased to announce that Hutton Companies, one of Southern California’s foremost developers, has begun construction on La Verne Village, a 172-unit mixed-use residential and retail community in La Verne, Calif., located in the San Gabriel Valley, east of Los Angeles, on Foothill Boulevard, the Historic Route 66. OAKLAND, CA - March 19, 2013 - (RealEstateRama) -- Award-winning national firm KTGY Group, Inc., Architecture + Planning, is pleased to announce that SummerHill Apartment Communities of San Ramon, Calif. (formerly known as Urban Housing Group), has begun construction on The Lane on the Boulevard, a 141-unit architecturally distinctive apartment community in Redwood City, located on the San Francisco Peninsula, just north of Atherton.